FILE - Turkish President Recep Tayyip Erdogan makes a speech at the Presidential Palace in Ankara, Nov. 26, 2015. Ankara summoned the American ambassador, John Bass, on Feb. 9, 2016, to protest remarks by a State Department spokesman who said Washington does not consider Syria's Kurdish Democracy Union Party (PYD) a terrorist organization. The rift between Turkey and the U.S. widened late Tuesday when Ankara summoned the American ambassador, John Bass, to protest remarks by a State Department spokesman who said Washington does not consider Syria's Kurdish Democracy Union Party (PYD) a terrorist organization. Earlier Tuesday, Turkey’s Foreign Minister, Mevlut Çavuşoğlu, echoed President Erdogan’s remarks that the U.S. must decide who it is partnering with in Syria: the PYD or Turkey. Çavuşoğlu said Western countries needed to make up their minds. “Are we [one of] the partner countries in Syria in the fight against Daesh or are terror organizations?” said Çavuşoğlu in Budapest during a news conference using a derogatory term for the Islamic State (IS) militant group. 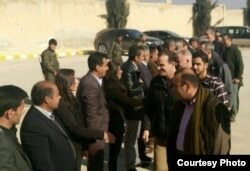 The tensions between the two countries were highlighted when the head of the anti-IS coalition, Bret McGurk, visited the Syrian town of Kobani late last month, where he met with members of the PYD and its militia, the YPG. U.S. forces have been supporting the YPG in its battle against Islamic State, but Ankara accuses the Syrian Kurdish group of being a terrorist organization connected to the Kurdish rebel group, the PKK, which Turkish forces are fighting in southeastern Turkey. U.S. Ambassador to NATO Douglas Lute is playing down the Turkish president’s ultimatum, while underlining the importance of the Syrian Kurdish groups. "These are not new concerns with regard to U.S. contact and U.S. support for the Syrian Kurdish groups," he said. "And of course the visit that you are referring took place into the town of Kobani, which of course was largely freed from ISIL control because of the effective fighting of those Syrian Kurdish groups." With Ankara providing airbases for U.S.-led operations against Islamic State, Washington is having to perform a delicate balancing act over its support for Syrian Kurdish groups. Analysts say Moscow is courting the Syrian Kurds' allegiance. Russia strongly backed the PYD’s presence, which Ankara successfully blocked, in last month’s Geneva peace talks. Moscow has also reportedly supplied arms to the Syrian Kurds. Political columnist Kadri Gursel for Al Monitor website said envoy McGurk's visit to Kobani was strategically important for the United States. "It is a very important gesture; it's a provocative gesture, but a legitimate one. It was a move destined to confirm the United States' position vis-a-vis Syria Kurds, and also a message to Ankara," he said. "And the United States is not wishing to see PYD Kurds being pushed to the Russians, this is what Ankara is doing, exactly." With Turkish political leaders designating the PYD and PKK as greater threats than Islamic State, analysts say relations between Ankara and Washington, are becoming increasingly strained. Gursel said those tensions have led to a redefining of the relationship. "Washington sees Ankara as a friend, but in the eyes of Washington, Ankara is an untrustworthy, unreliable, unpredictable friend," he said. "Believe me, Ankara and Washington are not on the same page, in terms of the Middle East." Washington, for its part, continues to call Turkey a key partner in its fight against Islamic State. But observers say with Washington’s priority being the defeat of IS, and with Syrian Kurds one of the most effective anti-IS forces in Syria, Turkish-U.S. relations appear destined to remain strained for some time to come.